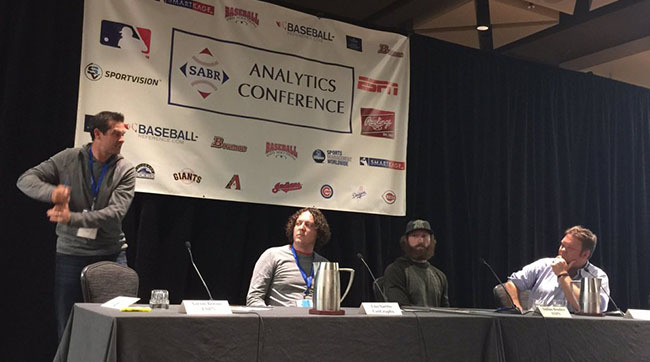 The 5th Annual SABR Analytics Conference kicked off in Phoenix yesterday — and it started with a bang. The highlight of the day was a panel called The Analytics of Hitting and Pitching. It featured ESPN analysts and former MLB players Aaron Boone and Dallas Braden, and FanGraphs.com's Eno Sarris. It was moderated by MLB Network Radio and Diamondback broadcaster Mike Ferrin. In case the former players aren’t familiar to you, they should be! Boone is famous for hitting a walk-off home run for the Yankees to beat the Red Sox in Game Seven of the 2003 ALCS. Braden, meanwhile, did something even more impressive: On Mother’s Day 2010 he threw a perfect game, one of only 23 ever pitched in MLB history. The event covered a lot of ground, from how stats are used to StatCast, a new technology being developed by Major League Baseball that tracks on-the-field stats like max speed of a runner or exit velocity of the ball off a bat. But the best part was the discussion of what analytics means to the panelists. Boone said what he finds most valuable is using advanced stats to help assemble a given team's roster or lineup. He added that he loves how players use analytics to develop their game and practice strategies. He gave the example how Cubs pitcher and 2015 National League Cy Young Award winner Jake Arrieta. Arrieta does yoga to help his body get loose — and because the pitcher sees the sabermetrics that contribute to his success improve when he is relaxed. Sarris agreed that advanced stats are valuable because they can be used to make players better. For Braden, stats mean something a bit different. He played his whole career with the Oakland A’s, the team that pioneered the Moneyball system of stats analysis. He said that when he played for the A’s, players were told not to use these advanced stats to win one specific game. Instead, they were taught to use them to assess the team as whole. He added that analytics should be something that helps individual players as much as their team. When players don't look at analytics and get hurt as a result, he said, they're hurting their teams as well as themselves. After the panel, I caught up with Braden to discuss how he would use analytics differently if he played today in the middle of the analytics revolution. He said that he would "pay attention to how I got the outs a little more, as opposed to just taking the outs. And what I mean by that is if it was ground ball, on what pitch am I getting the ground ball, and being able to analyze that information could definitely help a guy stick around a lot longer if that means changing how he's going about his business in an effort to maintain a certain level of health, so information is important, without a doubt." — The Diamond Dollars Case Competition: Graduate and undergraduate college students discussed their answers to the best five-man bullpen in baseball they could assemble, with some restrictions. The winners were NYU, Ohio University, and the Carnegie Mellon-Tepper School of Buisness. You can see their winning rosters on the SABR website. — Research presentations by Scott Spratt and Jason Sherwin discussed defensive shifts and how the brain sees baseball. These were huge hits, as each presentation garnered tons of questions. — An MLB Now panel moderated by MLB Network's Brian Kenny featuring foxsports.com's Ken Rosenthal, SABR President Vince Gennaro, and former player and current MLB Network analyst Eric Byrnes: This group discussed specific issues of analytics in the game today, such as whether Joey Votto should keep taking walks or be more aggressive, while working in tons of humor along the way.